Federal University Oye-Ekiti (FUOYE) First [1st], Second [2nd] Admission List of Successfully Admitted Candidates for 2018/2019 Academic Session Out. 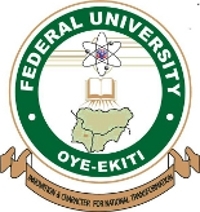 Authorities of the Federal University Oye-Ekiti (FUOYE) has published the names of candidates offered provisional admission into its various undergraduate programmes for the 2018/2019 academic session. FUOYE first and second admission list is now available and uploaded online. STEP 1: Kindly log on to FUOYE admission status portal via https://ecampus.fuoye.edu.ng/putme/. STEP 2: Enter your registration number in the required column. STEP 3: Click on ‘Login’ and then click on ‘Admission Status’ to access your FUOYE admission status. Acceptance Fee Payment Deadline: 7th November, 2018. If the status displays Not Yet Admitted after you have completed steps above, do not panic, log out as usual and check back later.